Perhaps the question I am asked the most often by others is, “What’s going on in that head of yours?” Because I am always. Thinking. Lost in the thoughts in my head, much to the wonderment of those around me. And I have to confess, I love a good scar. Ever since I was a kid, I used to hope that the scratch on my leg or cut on my arm would turn into a scar. That’s so weird, I know. And there’s probably some scary psychological reason why I like scars. But on a surface level, without giving much more thought to any deeper layers, I like scars because I like good stories. And every scar tells a story. My most notable scar is on my right knee. I was a freshman in high school and decided to run track. Hurdles, to be exact. And my very first track meet was at a school with an asphalt track. The black, tarry kind of track with the little black rocks that get stuck in the soles of your tennis shoes. The gun went off, and I started my race around the track, only to hook my back leg over the top of the hurdle and eat it, knee first, into the asphalt track beneath me. I had to be carried off the track with an oozing wound and little black rocks stuck in my knee, and that ended my career with the hurdles. The only good thing that came from the fall was a scar that healed over time and makes a good story to those who ask. But in addition to the stories they tell, I think I also like scars so much because they are a reminder in a world where we are so darn fragile, tiny, and small, that while we are destined to fall, we are also made to heal and live to tell our story. And if our skin can heal in amazing ways, then perhaps our hearts can heal as well. I was reminded of my affinity for scars recently when a friend of mine’s little girl was running through a hallway and split her forehead open on a doorknob. The wound turned out to be worse than was initially realized, and after an attempt at gluing the cut, several trips to the doctor, and then finally, stitches, my friend was having a hard time with the whole experience. She wasn’t upset about the fact that her daughter fell, or needed stitches, or even the pain involved; she was upset that she had not known how to handle the situation correctly from the get-go. She was grieved that she had caused potential harm to her daughter by not taking the right course of action from the beginning and could have caused her daughter a deeper and more serious scar. As we talked through it, we both realized that the incident with the doorknob wasn’t even so much about the scar as it was about the story the scar told – that as parents, we don’t always make the right or perfect decisions for our children. That we can do things that cause them to hurt. Or fall. Or carry a scar. And that is just plain, downright terrifying. Because if there is one thread that unites all mothers of the world together, it is this: we never want to do anything, intentionally or unintentionally, that causes our children to carry a scar. We shudder at the thought of scars of the flesh or scars of the heart caused by…us. But let’s face it: there isn’t a person in the world who hasn’t ended up in the ER or on a counselor’s couch because of a parent’s imperfections. And just to be clear – I am NOT talking about trips to the ER or wounds inflicted because of physical abuse. There is never an excuse for abuse – physical, emotional, or verbal. But I am talking about the kind of wounding that occurs just because we are broken, fallen people who live in a broken, fallen world and cannot always know how to make the perfect decisions for our children. We are all, all of us, going to fail our children on some level. And that’s a tough pill to swallow. But here’s the thing: our scars tell our stories. And if we let them, our scars remind us of the lessons we have learned from the great teacher and tutor of pain and the healing and redemption we have received at the hands of our Great Physician. Take Mia Grace for instance. She has a scar that runs from the bottom of her nose to the top of her lip, a scar that was made because of the surgery for her cleft lip and palate. 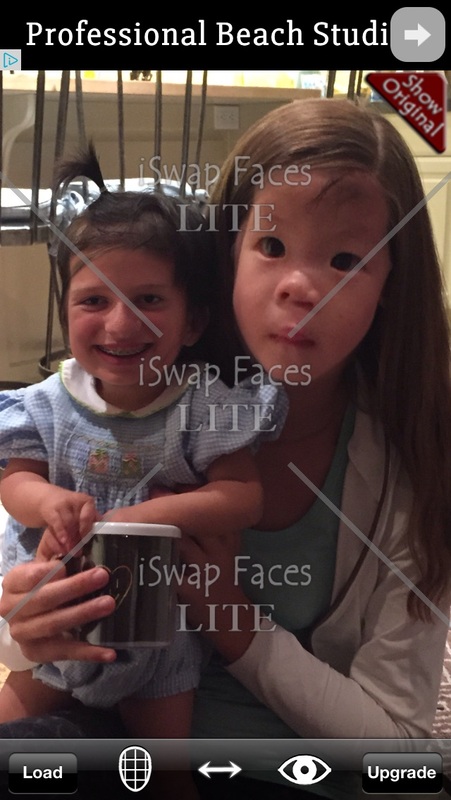 And because of her cleft lip, she is destined for more surgeries and more scars in the future. But I’ve spent some time thinking about how that scar will affect her when she is fourteen. Or twenty-four. She might not be so blind to or casually dismissive about it. And her scar might have the potential to harm her self-image, depending on the story she chooses to believe. You see, our scars tell us our stories, but we have to choose what story we are going to listen to. But, when we know and are known by the Lord Jesus Christ, we have to learn how to let Him tell us the story of our scars through the lens of the truth – through the lens of His redemption, adoption, goodness, glory, and grace. And as parents, that’s what we must trust about our children’s scars, even the scars we inadvertently make. They are holy ground upon which the Lord loves to tread, and they have the ability to tell our children something true, right, and beautiful about their past, present, and future as the children of God. Today, or this week, consider writing out the narrative of your scars or even your children’s scars. Like I did for Mia Grace, write out two different narratives – the truth and then the lie you are tempted most often to believe. And then listen, actually listen, to the narrative of the truth that has the ability to set you free and heal you from the inside out as you look at your scars. Because while we would love to set up ourselves and our children for a life without scars, we must remember that there is always life in our scars, beginning with the scars bound up in our Healer’s hands. For the Hands that hold us are scarred as well, scars caused by a good Father who allowed His One and Only Son to be crucified so that we could find life in our own scars every time we look, and listen, to the One who works all things for our greatest good, and His greatest glory, even through, and especially through, our scars. I don’t know where my daughter was the day she was born. I don’t know if she was in a hut, laid in a pile of dirty rags or straw. I don’t know if she was in a clinic, laid on a cold, metal scale to weigh her tiny body and cracked crevice of a lip. I don’t know if she was in a field, laid in a nest of woven grass or beside the rush of a river. I don’t know if the sound of her first cry, drawn from the healthy lungs God had given her, was met with tears of joy or a pang of sadness. I don’t know if the sight of her face, her gender, and her parted palette was met with sorrow mixed with compassion or anger mixed with disgust. I don’t know if her momma gave her a whispered name, one she still treasures in her heart, or if she left her name to the orphanage where she left her. But I do know this. Wherever she was on the day she was born, whatever emotions her mommy and daddy expressed when they saw her, whatever name they whispered in their heart, there was One above it all who held her in His heart, kept her safe those first few days of life outside the womb, directed her momma’s steps to a hut outside the Guangzhou City State Orphanage, and watched over her as her momma left and the police and orphanage authorities came in. And those first seventeen months of life when she was without parents, He was getting us ready to be her parents. He gave me her name long before I ever saw her face. He gave her my eyes and a certain look that causes people to stop and tell me, “You know, you two look alike.” He gave her blonde-haired, blue-eyed kindergarten sister, Lillian, strong prayers to pray for an adopted sister from China that kept her fearful momma going in the rounds of paperwork when I wanted to stop. He gave her daddy a fire in his heart to tirelessly fuel our adoption journey from start to finish until the orphanage director brought her from back behind that curtain and placed her into our arms. I had heard that God’s heart was for the orphan, and I had read about it in the pages of Scripture, but I never really knew it until I looked full in the face of Mia Grace. “Do not fear,” God spoke to my heart in the first few months of our adoption process, “for I have redeemed her; I have called her by name; she is Mine!” (Isaiah 43:1). And “Mine” became her name, straight from the word of her Father who was weaving her together in her mother’s womb, long before we ever saw her face. So while I don’t know many details about Mia Grace’s birth day, or her first birthday, I know exactly where she will be tomorrow on her third birthday. Instead of shrouded in rags or hidden in any sort of darkness, she will be surrounded by the light of those who love her and shout her name in joy whenever they see her beautiful face. And isn’t that the beauty of adoption? It peals back layers of darkness to let light shine through. It turns whispered sorrows into shouts of joy and gladness. It pulls victims from pits of abandonment to place them into families of belonging, hope, and trust. It rewrites stories of shame into stories of redemption, beauty, grace, strength, and love. And it gives each and every orphan a chance at a new name. And if you don’t know Christ, today, today, make your story one of adoption. Bow your knee and bend your life to the Father who parted heaven to seek you and save you in the broken body of His Son. And consider spurring others on in their journey of adoption or continuing on in your own journey if you know that is where God is leading you. Pray for families who have adopted a little one from another country or another ethnicity or another biological set of parents. And pray that more orphans will be adopted; pray that God will stir families’ hearts to have the courage to start and finish the adoption process, even when it’s hard; and pray that our country and countries around the world will make the adoption process easier on those who want to adopt in order to provide strong, healthy, godly families for children who have great needs. And consider giving to help others adopt, even if you cannot. Adoption is an expensive, messy business, and the costs can be huge. So your gift can go a long way in helping other families who want to open their home to a child but cannot do so without financial assistance. Adoption isn’t something we do because it makes us feel good; adoption is something we do because it is good, and it highlights the goodness of the One who has adopted us. 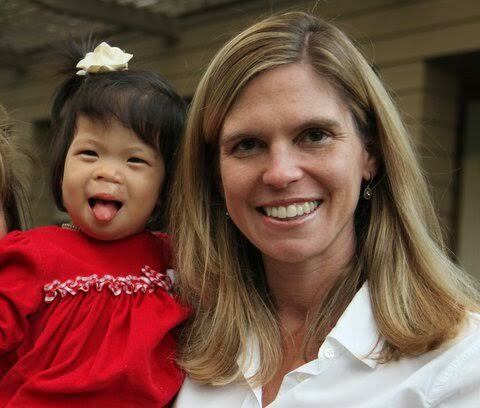 So celebrate Mia Grace with us this week, and celebrate your adoption too into the family of God. And then reach out and further the Kingdom of God and the Father heart of God and pray and risk and give and battle for the children God loves and has named and called His own. Adoption is beautiful and hard. That’s what a friend told me a couple of weeks ago and the phrase has stuck in my head and rolled around in my heart like a catchy tune or phrase. Because that pretty much sums it up. Sums up our year. Sums up our days. Sums up our moments. Last Wednesday, July 13th, marked the one year anniversary of Mia Grace’s Gotcha Day, her “birth” day of sorts into our family. It was the day an orphanage director named Wendy walked out of a back room curtain holding a seventeen-pound seventeen-month-old serious faced little thing whose head was damp with sweat and whose hand clutched an orange little plastic shovel as if her life depended on it. (To read more about our adoption story, click here.) After placing her into my arms and giving me a five minute low down on Mia Grace’s schedule, history, and daily rhythms (not much time or information when someone hands you a total stranger of a seventeen-month-old), Wendy departed, and the whole experience of Gotcha Day lasted about twenty minutes after we had waited for a daughter for almost two and a half years. And I still remember the exhilarating feeling of riding with former LingYu Xu now Mia Grace Baker, in the car back to our hotel, feeling like we had just busted someone out of prison. I couldn’t wait to get the orphanage smell, the orphanage clothes, and the orphanage shovel out of her hands and let her start becoming a Baker, an official member of our family. And what a becoming it’s been. Sometimes the beauty and the hardness of it all still catches me off guard. I have been asked a number of times this year if loving Mia Grace is harder than loving my biological children. Yes and no. With my biological children, loving comes easy. They have my scent, my brown eyes or Jason’s hazel eyes, my husband’s walk, the personality traits of their grandmothers, and a connectedness to my mother’s heart that goes back to the long nine months of carrying them in the womb and soaking in their sweet baby scent in the hospital. I don’t have those things with Mia Grace. Sometimes I’m still taken aback to look down in my arms at the little person I’m holding and see brown skin, dark brown, almost black, beautiful almond shaped eyes, and a small, petite stature that looks nothing like mine. Nothing about her looks like me. There is nothing biologically or historically speaking that draws her to me or me to her. But the love I have for Mia Grace isn’t based on biology. It’s based on something deeper, truer, beautiful, and fierce. It catches me off guard and makes me catch my breath. It’s a love that sometimes feels different and looks different than I have for my biological children, but it’s a love like steel that has uncuttable cords and reaches past biology into grace. Because when I look at her, I see myself. I look at my skin, the color of my eyes, the smallness of my hands, the hardness and often disobedient nature of my heart, and I don’t see anything about myself that looks like my heavenly Father. I am just so other than Him. Yet He loves me. Sent His Son to die for me. Wrapped me in cords of love and drew me to Himself in a love that will not let me go that is rooted and grounded in His glory and grace. I used to hear those words, see those words, and understand with my head but not necessarily my heart. But adoption has helped to change that. I understand a little bit more about this love that holds me and emanates from Someone who looks nothing like me. Who spent large amounts of His resources, in fact, the very best that He had, to change my name and secure me to Himself. So is it hard sometimes to love someone who looks nothing like I look or who shares none of my history or ancestors? Yes. But the beautiful far outweighs the hard. In fact, the hard has made the past year even more beautiful. I don’t know where you are today. I don’t know if you have ever experienced and received your heavenly Father’s unconditional, deep love and embrace, or if you have felt like you’ve had to earn it. Prove it. Work hard at it and for it. But from one very imperfect adoptive parent, let me tell you on behalf of the very perfect adoptive Parent, you are loved. No matter your looks. No matter your situation. No matter your past. No matter your present circumstances. The Father’s love for you isn’t based on your similarities in scent, or facial features, or shared history. His love for you is based on a decision He made, long before you were born, to go after you in your sinful, wretched state through the beautiful, hard death of Jesus on the cross. And once you have accepted Christ by faith and surrendered your will to His Spirit, His love for you is secure. Final. Complete. Bound to Him with cords of love that go deeper than biology. They are tied tight through grace. To celebrate Mia Grace’s “Gotcha Day,” I drove up to Java, the local coffee shop here in Ketchum, Idaho, the town where we are staying for the next several weeks, and bought a coffee for myself and a giant cinnamon roll for Mia Grace that was as big as her face. Over breakfast, the girls, Jason, and I went around the table while MG licked icing off her fingers and smeared the rest in her hair, and recounted all of the ways God has been faithful to Mia Grace and our family over the past first year of adoption. All of the beauty and all of the hard. Our cheeks were wet with tears by the end of our cinnamon rolls and testifying to the goodness of a God who has the power to make all adoption stories beautiful. The next day, I hiked up our favorite Ketchum peak, Bald Mountain, with Mia Grace on my back. The climb was a tough one, especially with the added weight of a two-and-a-half year old on my back, but once again, the hard of the uphill reminded me of the strain and hard of adoption. Of learning to love, bond, attach, connect with, and help train, raise, and steer someone with such a different history, past, biology, and story than mine. But then we got to the top. And we simply sat back and soaked in the beautiful view with an enjoyment more sweet and rewarding precisely because of the hard uphill climb. As people who love Jesus, it’s so easy to forget our “Gotcha Day” with the Lord the older we get. It’s easy to never pause and remember the cords of love that drew us and have never ceased to hold us, no matter how off course we get. And we lose our sense of wonder and awe in our own adoption stories, forgetting the hard parts of our past and our present climbs only serve to make the love we are held with more beautiful and the views more breath-taking. My challenge to you this week is to eat at least one cinnamon roll…and remember the great lengths God went to to secure you to Himself. Rejoice in your Gotcha Day, and recount at least ten different ways your Father has been faithful to you in the past. Then walk out into your day, your week, and your season in confidence, knowing that the hard is tightly bound to the beautiful, and God’s love will not let you go. That’s the story of adoption. That’s the story of Mia Grace. And that’s the story of you and me and all those who love King Jesus, the author of all adoption stories. Because for so long, for over two years, there was always so much uncertainty. Who would our child be? What would she look like? Would I ever have enough courage to make it through the piles of paperwork to even get a child? If we did, what kind of medical needs would she have, and what kind of surgery would be involved? What would her temperament be like? Would she be a cryer, a tantrum thrower, tough as nails, or solemn and sweet? What was her story and how much trauma had she endured? How would my biological children adjust? The questions, anxieties, and uncertainties were endless. But here we stand almost one year later with a trip to China behind us, a mound of paperwork in our past, and Mia Grace Baker in our arms as a permanent part of our family. But as I think back over the past year, if thankfulness is our primary emotion, becoming has been our primary action. What I mean is this: there was a moment in time, a singular moment in time, when LingYu Xu, legal ward of the Chinese government, was brought out of a back room with a curtain, clutching a kleenex in one hand and a tiny shovel in the other hand, her head drenched with sweat, and placed into my arms. In that moment, that singular moment, LingYu Xu became Mia Grace Baker and instantly went from orphan to adopted, alone to surrounded, and abandoned to beloved. She went from having no one claim her as their own to two parents, three sisters, four grandparents, ten aunts and uncles, nine cousins, twenty five neighbors and a host of beloved friends and wonderful extended family clamoring to hold her and love her as their own. She was welcomed in in every sense of the word in a display of love that still makes my heart swell with thankfulness. But as much as Mia Grace became our daughter in a single moment through the gift of adoption, Mia Grace had to become our daughter over the past year through the gift of adoption. And that was something I was not quite prepared for. It sounds ridiculous now to even admit it. I mean, how could I have expected a child who had a revolving door of caretakers, never heard one word of English, nor seen a white person to instantly trust a woman with pale skin who looked nothing like her and spoke in a strange dialect to trust me as her primary caregiver and mother? But as strange as it sounds, I think I did expect this instantaneous bond of deep affection and trust to occur. But that bond is something both Mia Grace and I have had to work hard on this past year. I never knew it would be so painful to have someone who calls you “Momma” to reject dependence on you at the most basic of levels. To stuff and hoard food in her mouth and refuse to swallow. To refuse to let me hold her bottle and hold on tightly with her two little hands while pushing my hands away. To refuse to face me in the rocking chair and snuggle in and demand to always face outward, a position she can control while monitoring the room and keeping a safe distance away from me. She had no idea in her little seventeen month old self how hard her independence was on a momma’s heart. But she wasn’t in daughter mode. She was in survival mode. She was in abandoned-orphan mode, even though she had been adopted. And because of that, Mia Grace had to learn how to become. And she has come so far. In less than a year, as long as I have read the requisite two books before nap time or bedtime, she will face inward and let me rock her for a long, long time. She still refuses to close her eyes or fall asleep in my arms and let go of complete control, even if I know she’s exhausted. But hey, I will take what I can get. After a year, she will actually eat and swallow about four or five bites of meat or a protein before stuffing the rest in her mouth and make me fish it out an hour later, but a quarter of a hot dog is better than no hot dog at all. After a year, she will approach me from the front to give me a hug instead of only feeling comfortable enough to hug from behind. After a year, she has stopped reaching up and out for strangers to hold her and is content to be in mommy’s arms. Just like Mia Grace, I have orphan habits too. In fact, perhaps the hardest part of adopting Mia Grace has been the way that she has made me look at my own orphan habits. And in order to help her put her habits and control tendencies aside, I’ve had to put mine aside first. And if I’m honest, that’s been really hard to do. To make her stop trying to control, I try to control right back. And trust me – I’ve learned this one from experience – you can’t fight control with control. Someone always ends up broken in the process. You have to fight control with humility and love. When she begins to act out in fear, I have to help her go back to the place where the train derailed, back to the point in her heart and mind where she was left and abandoned by the two people on planet earth who were never meant to abandon her, and help that place of derailment, unhealthy independence, and lack of trust heal. Through trust. Love. Patient words. Slow responses of healing and empathy instead of quick reactions of anger. And that is so tough to do for someone who is a recovering control addict herself. Becoming the Beloved of God is hard. When all you can hear are the voices of failure whisper their way through your day, it is so hard to believe, I mean really believe, you are the Beloved, the beautiful, and the valuable of God. Becoming the Beloved takes intense focus, concentration, and consistency in training our ears to listen to the Voice of the One who loves us, made us, and calls us His own. And just as I have needed time and grace to become the Beloved of God and to pull the truth of who I am into the rhythms and specific realities of everyday life, Mia Grace has needed that time and grace too to become my daughter in the daily rhythms of everyday life. So one year in, both Mia Grace and Mommy are still working on becoming children instead of orphans – me a child of God, and Mia Grace a child of mine. But we are learning, she and I. We are learning how to become, how to rise up from set backs, how to recover from falls, how to say “I’m sorry” when we’ve failed, and how to believe God works all things for the good of those who love Him and are called according to His purpose as His Beloved. Last week Mia Grace (our cute-as-a-button 2-year-old adopted daughter from China) and I were at her weekly Occupational Therapy appointment with “Miss Julie,” my new favorite person on the planet. 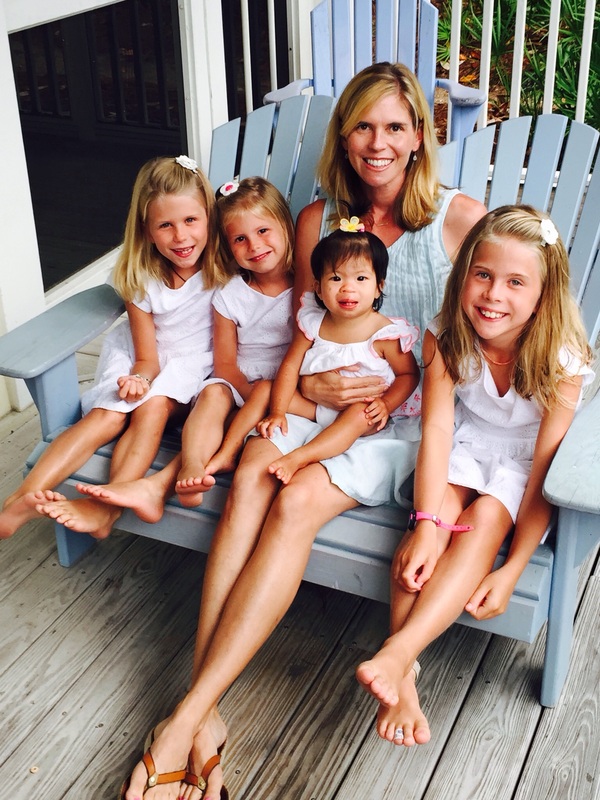 Julie Ploetner runs PolkadOT Pediatric Therapy, and her office is pure heaven for Mia Grace. The minute she walks in the door, she heads straight for the rice pool (literally, a blown up plastic pool filled with rice and tiny plastic treasures of all shapes and sizes). She slips off her little shoes (sister wears a size 6-9 month shoe…her feet are TINY) and slips in the rice to play and pour and sift and sort to her heart’s content. After she’s had her fill of rice, she heads on over to a massive cushion with plastic frogs and turtles on top to see how many she can carry in her hands on her way down the massive “mountain” of fluff. It’s always good times in Miss Julie’s office. It’s amazing what spending time on pillows and swings and in rice tubs can do for one’s body and soul. I’m thinking adults should try it more often. But as I sat there by Mia Grace, watching her sift rice through her little fingers, I was (very unconsciously) holding tightly onto a plastic necklace made up of stars and hearts. I would squeeze it with one hand, and then pass it to the other hand. Back and forth, back and forth, back and forth. All of a sudden, Miss Julie looked at me and said, “Is that comforting to you to hold on to that necklace? I’ve noticed each time you are in here you like to hold things in your hands. You must have a lot on your mind.” Wow. I’m pretty sure I looked at her like someone had caught me with my hand in a cookie jar. True confessions in PolkadOT Therapy. I considered right then and there if I needed to slip off my shoes and climb in the rice next to Mia Grace for a little therapy myself. But Julie got me thinking, all week in fact. This time of year for moms can be downright stressful. Saying goodbye and finishing anything well always is. And saying goodbye to an entire school year with your kids takes a lot of time, focus, and energy. 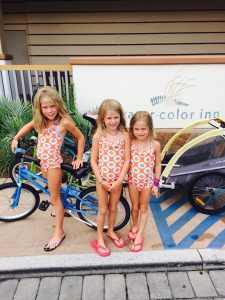 On top of that, the new season of summer looms on the horizon, and a blank slate stares at moms in the face, waiting to be filled in whatever way we think our family needs. No pressure. But there is pressure. And that’s what Miss Julie picked up on. I often travel through life, especially this time of year, with a low level of continually burning stress. Through every appointment or conversation, I am present in body but my mind is running a million different directions sorting through every list on my desk and in my head. I constantly fight feeling behind or like I will never catch up. So at rare moments when I am just sitting, like I was doing during Mia Grace’s appointment, to focus my stress, to help my out-of-control feel more in-control, I hold things in my hands, or in this case, press the heck out of a plastic necklace. There has got to be a place for our stress to go that doesn’t have anything to do with plastic necklaces or what we can control with our hands. I am learning, more and more, that I have got to leave things in God’s Hands, especially during times of the year when I am more prone to stress. My husband, Jason, was teaching on Sunday morning about taking big risks for God. Taking risks to love other people well, to forgive when you don’t want to, to reach out and bless someone with a kind word…because people are dying all around us for a touch, for a word, and for us to be risk takers in this area of love and kindness in the Name of Jesus. Don’t misunderstand what I’m saying – I think God does want us to risk big things for His Name when it comes to our finances and our time and our very lives. But I think He wants us to start with risking our hearts and who we really choose to trust. The words of Jeremiah 17 came to my mind, and I’ve been thinking on them all week: “Cursed is the one who trusts in mankind and makes flesh his strength, and whose heart turns away from the Lord. For he will be like a bush in the desert and will not see when prosperity comes, but will live in stony wastes in the wilderness, a land of salt without inhabitant. Blessed is the one who trusts in the Lord and whose trust is the Lord. For he will be like a tree planted by the water, that extends its roots by a stream and will not fear when the heat comes; but its leaves will be green, and it will not be anxious in a year of drought nor cease to yield fruit” (Jeremiah 17:5-8). So this week, when I’ve been tempted to press something with my hands, I’ve been working on pressing the words of Jeremiah 17 into my heart. I’ve been working on practicing the presence of the Lord and the presence of people He puts right in front of me by trusting Him with my lists, my time, and the plastic necklaces I hold in my hands. I practiced it last night when we celebrated Jason’s birthday and the girls made him silly cards and wore silly hats. I practiced it when we pulled out the dvd player and watched Star Wars: The Force Awakens in the middle of the week for a birthday treat instead of answering emails and checking more things off my to-do list. I practiced it by going up to the friend I never see in the grocery store and talking for ten minutes instead of ducking my head and praying we didn’t catch eyes simply because I didn’t have time. I practiced it when Lizzie asked me to slow down this morning and scratch her back instead of getting on with fixing breakfast. I practiced it by letting the girls enjoy cake pops this morning as a “last day of homeschool” treat instead of doing our usual routine. And I practiced it this morning with an open Bible in one hand and a pen and paper in the other, recording all the ways God has been faithful to us this year, even when I have been faithless. And I’m going to continue to practice it throughout the days ahead by intentionally trusting the Lord, putting all things into His Hands, instead of holding them so tightly with mine. This morning when I saw my friend Brandy and we were laughing about the craziness of the end of school, she said, “It’s a good thing this is our last week because they either need to shut school down or send me away. At this point in the year, those are the only two options!” Amen, sister. But until the last day of school, the last homework assignment, the last teacher gift, and the last packed lunch, let’s continue to encourage one another to keep our gaze on the One who holds us all together, even our plastic necklaces, with His Hands. Let me introduce you to some people who are pretty important people in our world. Around our house, they are affectionately known as the “BK Team,” but in the real estate world, they are known as “BakerKatz.” These are the people who make our lives run and keep everyone (i.e. Jason and all of his women) afloat. Well, let me put an addendum on that. Really I should say, Traci and Jennifer keep our lives afloat. Because let’s face it BK Boys, if you take away the BK Women, you pretty much don’t have BakerKatz. They are the ones who keep Dana and Sus sane, Jason focused, Kenneth culturally updated, Neil hilarious, Lunden Italian, and Ben willing to stick around. And…this is an important one here – they keep snacks in the kitchen. Let’s go back to that keeping Sus sane thing. Both Jennifer and Traci are something I am not: resourceful. And they don’t dissolve in a crisis in a puddle of tears. (No wonder Jason likes them so much.) They figure it out. Jack Bauer style. While everyone else is sleeping, I’m pretty sure Traci and Jennifer are up, figuring out how to save the world. They can figure out how to do anything at any time with any budget from any point on the globe. Need to figure out how to get from the rural Indian countryside to a major city airport in a rickshaw? No problem. Need to figure out how to purchase a building, prepare LOI’s, and keep clients eating out of the palm of your hand? Done. Need to figure out how to review a document from the middle of the hills in the Lake District where there’s no internet reception? Got it. Need to figure out how to get a refund on tickets when Continental merged with United and it takes you four days to get from Houston to Scotland and you are stranded with three kids, without luggage, on the floor of the airport in Frankfurt, Germany? Piece of cake. Need to figure out how to add an adopted kid to your insurance policy whose official name is still LingYu Xu (the name, apparently, of a famous Chinese pop star), but her adopted name is Mia Grace Baker? Easy. Kid’s stuff. Need to figure out how to wade through all things paperwork and birth a baby through notarized documents, FedEx packages, certified checks, and official copies of birth certificates, social security cards (I still don’t know where my husband’s is), marriage licenses, and proof after fingerprint proof that YOU ARE NOT A CRIMINAL?!? Not a problem. I can say with utmost confidence that if Jennifer and Traci were not around, there is a strong possibility that Mia Grace would not be around either. I would have plunged off of the paperwork face of the earth and shriveled up in a hole somewhere to die a slow death. So that’s why, when we returned from China with Mia Grace safe and sound in our arms, some of the very first people I wanted her to meet where her BK Family. They had skin in the game, so to speak, just like Jason and I did. And, of course, Mia Grace took to the BKWomen like a rat to a cheeto…literally. She was won over by the snacks…and, of course, the huge smiles on their faces and tremendous love in their hearts. BakerKatz, the Baker Six couldn’t be more thankful for each of you, and of course, for all of the SNACKS!!! It was a “soft start” kind of a week since they were only in school for half the week. We go to a school where my kids attend school on campus on Mondays and Wednesdays, and I home school them on Tuesdays and Thursdays. Fridays are “free days”, where good home school moms take their kids to places like museums, historical markers, and the original log cabin where Laura Ingalls grew up. By Friday, I am usually laying on the couch in a comatose state attempting to take a four hour nap while my kids are left to entertain themselves in the house with art projects left over from the summer. 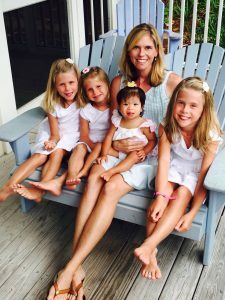 I am in full support of Jessica Trozzo’s statement, my friend and fellow homeschooling mom, that “our kids have really fun lives; I don’t feel the need to entertain them every Friday.” At least, that’s how I comfort myself when I lay down on the couch on Fridays. So this week is official – we are really back in school. Yesterday was our first Tuesday home day, and I have to be honest, I had forgotten from last year what long days Tuesday are. Thursdays we have a little more breathing room. If we didn’t have time to fit Grammar in, or we forgot about Science, we can squeeze it in over the weekend. But there is no squeezing on a Tuesday; everything has to be crammed in to be turned in and ready to go for a campus school day on Wednesday. And by yesterday evening, when Jason walked in the door, I didn’t even have words left to tell him how the day was. All of my words had been used up by 3pm, and all that was left was silence or an occasional grunt. Are you getting the picture? We’re not exactly the Brady Bunch over here on Tuesdays and Thursdays. I feel more like a circus master running a four ring circus. It doesn’t help, either, that I am teaching Sunday School for the first time on Sunday since getting back from China. Which means every morning at 5am I drag myself out of bed and stumble downstairs to sip on a cup of coffee while I try to put coherent thoughts about the Bible together in my brain and on paper. I love trying to put coherent thoughts about the Bible together; what’s tough about teaching, particularly this week, is that to teach a good lesson, you have to live a good lesson. You have to hold your own life up under the bright light of the Word of God and let it convict, challenge, and change you if you don’t want to be a hypocrite when you stand up there on Sunday morning. All that to say, this week’s lesson has been particularly challenging because it’s on the parable of “The Great Banquet” that Jesus tells at a dinner party in Luke 14:16-24. I always find the toughest, most challenging lessons to teach are on the words of Jesus Himself. His words are just so – hard. And difficult to understand. And I always find myself so lacking underneath the weight of the words of this God-Man who came and flipped the world upside down with His justice, mercy, love, and grace. Particularly during a season when I am struggling to give grace to my kids, much less to a waiting, hurting, groaning world. I won’t go into all the details of the parable, but what has given me hope this home school week are the three groups of people invited to the banquet Jesus outlines in Luke 14. The first group represent the religious elite, the people who sit in the pews, who know the Word of God backwards and forwards, who have grown up in church, but do not know Jesus Himself. They are hell-bent on making their own rules and regulations to the Great Feast and Table of the Lord, and Jesus, with all of His grace, is messing up their guest list. With tax collectors like Zaccheus. Prostitutes like Mary Magdelene. Blind beggars like Bartimaeus, truth seekers like Nicodemus, blue-collar, uneducated fisherman like Peter and demon-possessed Gentiles like the man from Gerasene. Not only do they dislike Jesus, but they are doing everything in their power to completely stop the banquet from even taking place. So they refuse to come. No show at the last minute in a deliberate attempt to publicly humiliate the host and bring him shame and dishonor. So how does the Host respond? Does He go out and wreak havoc on all of those who have rejected His invitation to His table? Quite the opposite. In the words of Kenneth Bailey, “The host reprocesses his anger into grace” and begins to invite to his banquet all those who could never pay him back. He tells his slave, “Go out quickly to the streets and lanes of the city, and bring in the poor and crippled and blind and lame.” This second group of invitees represented the lost sheep of Israel that Jesus came to seek and to save, but it also represents you and me. It represents all those who are outcasts and who have been on the outskirts their whole lives but now, according to the lavish mercy and grace of God, have been invited in. I know because I have one of these invitees who sits at my table on a daily basis. She has black hair and brown eyes and the cutest little dimple over her right cheek you have ever seen. She is a daily reminder to me of GRACE. Of the grace that sits at our table and the grace that is the only ticket to sit at the table to come. And her story of being outcast, abandoned, forsaken, and then brought in to a family and to a table is a reminder to me of all of our stories. Sometimes, though, it’s easy for me to forget my story and my need for an invitation in. Because let me tell you, more times than not, I am in the first group. The religious group. The group that thinks I have no need of the Savior’s table or can make up my own rules and set my own table. And then Jesus’ grace undoes me and I move from outside the door to take my place at the table with all of the rest of the broken invitees. I know that once I yielded to Christ as Lord I have never lost my place at His table, but I sure do have the tendency to get up and move around at lot. Yesterday, I took Mia Grace to a long time friend and gifted photographer to have her picture taken, an official portrait for the Baker Girl Wall of Fame. Cindy had never met Mia Grace but was well aware of her story and how long we had waited to bring her home. As soon as she saw her, she started to weep. And throughout the photo session she wept. After every few pictures, she had to put her camera down to wipe away her tears. I have discovered that Mia Grace has this effect on people. In the midst of our everyday, day-to-day, rat race and craziness, Mia Grace is this burst of…grace. A reminder of our invitation to the table. A reminder that we, too, are invited in. To sit down. To pull up a chair. To be called family. To know and be known. And to feast. Not in spite of our brokenness, but because of our brokenness. And because of the Host who died to make us whole. So today, whoever you are, whatever your brokenness looks like, whatever your past or present, and wherever you’ve been, keep the feast, accept the invitation, and sit down. You have a Savior who is waiting. I know I haven’t posted in a while…and for that, I apologize. After all of the adrenaline and excitement involved with going to China to get Mia Grace and coming home to introduce her to her new “normal”, all of the words just…left me. That’s not entirely true. The words were still there, circulating beneath my thoughts and our days; it was just that I was too weary to let them out. I think both Jason and I discovered that while we were prepared (at some level) for food issues, sleep issues, attachment issues, language issues, what we were not prepared for was the issue of…weariness. Attaching to an 18 month old you have never met, is from a different country, is used to a different language, different food, and whole different way of doing life is plain ol’ exhausting. So Jason gave our family a gift that was a blessing beyond words – a week at the beach. 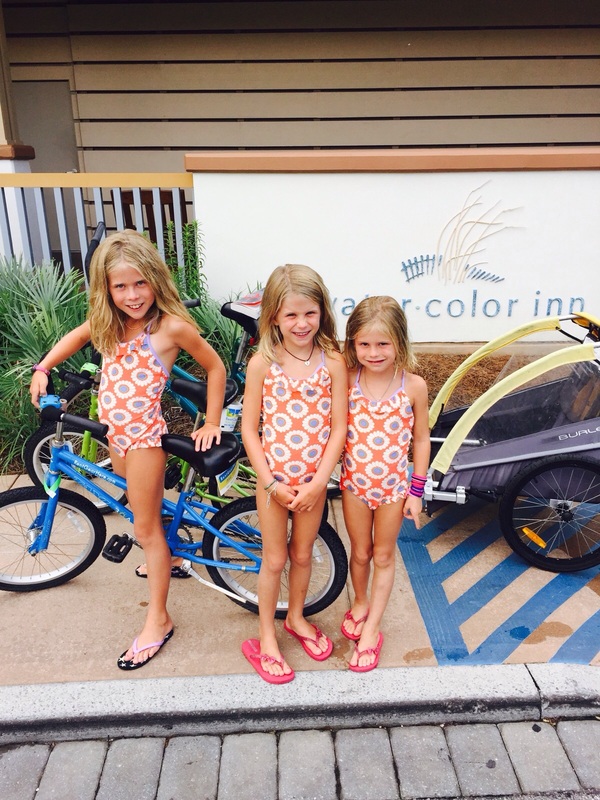 The big girls don’t start school until after Labor Day (today in fact! ), so we packed up our swim suits, flip flops, and t-shirts, and spent a week in Florida. It was heavenly to do nothing but sit in a chair or in the sand and look out over the wide expanse of sand and sea and simply soak in beauty while enjoying the company of one another’s presence without any other demands. Our biggest decision of the day was when to go frequent our favorite snow cone trailer truck in the little town close by, just a bike ride away. I wasn’t sure how Mia Grace would respond to the texture of sand or the wide expanse of the sea, but to my surprise and delight, she loved every minute of it. She loved running the tiny grains of sand through her fingers and loved the feeling of sand poured over her toes. She dug in the sand for hours with her small shovel and pail underneath the brim of her big pink hat. And she loved being held out in the blue waters with daddy, her big brown eyes wide as she slowly took everything in, including the salty waves. More often than not, Jason and I are mountain people. We love to hike, conquer a peak, conquer a trail, and soak in mountain air and mountain views. The majesty of the mountains moves both of us in ways the ocean sometimes does not. But this week, instead of the mountains, we both instinctively knew we needed the beach. It took me getting there and looking out at the view multiple times before I finally understood why. I think that’s what Jason and I and the girls needed to hear. Because after weeks of learning to love this new little person in our midst, we needed to hear that we were loved as well. We were cared for under the blanket and tender care of God’s love while pouring out love on another. A picture of this came so vividly and beautifully the last morning of our trip. Well, let me back up. The first morning of our trip, we gathered up all of our beach gear, lathered everyone in sunscreen, and headed down to our spot by the water. We were still getting situated when the guy under the umbrella next to us said, “Look! There’s a dolphin!” We looked up to see a family of five out in the surf with a five to six foot long, dark shape gliding in the waves just a few feet from them. It didn’t take long to realize from the fin on the back and the angles on the body underneath that was no dolphin…it was a shark. Apparently, the family in the surf realized the same thing and made a bee-line out of the waves back onto the safety of the shore. For the next thirty minutes or so, not one shark, not two sharks, but five or six sharks made their way to the edge of the surf, coming so close to the shore you could almost touch them. If you are like my husband, Jason, then seeing sharks that close up in the surf just about makes your day. He was so gleeful, so excited, he waded OUT IN THE MIDDLE OF THE SURF to try to get a close up view. Geez. Ever since I’ve known him, one of his life aspirations is to go down into the shark cages off of the coast line of Australia or South Africa to get a close up view of the great whites. No thank you. No sir. Not me. Just the mention of the word “shark” sends a cold feeling down from my spine into my toes. Not only was I up on the shore at first mention of the word “shark,” but I stayed up on that shore for the next two days. I like the safety and security of the sand between my toes more than the possibility of a shark nibbling on them. We never saw the sharks again after that first day (thankfully), and I eventually did get in and enjoy the water, but every time I was in the water, there was always a near by thought that the sharks COULD reappear. But at some point, the decision had to made to resolutely forget about the sharks, or the possibility of them, if the water was ever going to be enjoyed. So the last morning of our trip, I was on an early morning run on the beach. Not many people were out, and if they were, they were walking or running along the shore like me. But along our stretch of beach, only two people were in the early morning waters – a daddy with his little boy who couldn’t have been more than 18 months old, blonde curls bobbing on his head, and his orange pacifier still in his mouth. They were enjoying the vastness of the ocean, just the two of them, probably trying to beat the heat of the day. The past two months with Mia Grace have felt a bit like that first day on the beach with sharks in the water. There has just been so much unknown. Anything at any point could come up and grab you taking sleep, taking rest, taking security, from her mainly, and from us as well. But our time at the beach was a reminder that in the unknown, the love of the Father holds us, comforts us, and gives us the ability to take delight in the process of loving and being loved, no matter what may come. Underneath that blanket of love and thankfulness we rested and came home, ready to start the school year, ready to continue through the new normal with Mia Grace. Sometimes that’s all we need – not another adventure and not another activity – just another reminder of His arms, holding us close in the vast expanse of His love. My husband grew up in a male-dominated household. Yes, he had a mother and a sister, but his larger-than-life father, my husband, and his two brothers dominated the scene. They are all tall, broad-shouldered, and their favorite past-times include hunting, sports, anything outdoors, and did I mention hunting? My sister-in-law, Cara, and my mother-in-law were great sports about everything sport-related. They went with the flow, learned to like watching any sort of game with a ball, and my sister-in-law even consented to being nicknamed “Carl.” I will never forget going on a hike with my mother-in-law a few years into marriage; we saw a clod of dried animal poop on the trail, and I as skirted around it, SHE PICKED IT UP. WITH HER BARE HANDS. And proceeded to carry it down the mountain so she could ask the guide at the bottom what kind of animal made a mess like that. If that woman isn’t a great boy’s mom, I don’t know who is. All of this to say that I find it one of life’s greatest ironies that out of my father and mother-in-law’s ten grandchildren, eight are girls. Yes, that’s right. Eight. Four belong to Jason’s sister, Cara, and her husband, Lance. Four belong to Jason and me. And the two boys (bless their hearts) belong to Jason’s brother, Jake, and his wife, Haley. The last remaining brother, Josh, and his wife, Laura Grace, have yet to have children, but even if they have four boys, the girls will still rule the roost in the Baker family. Irony is sweet sometimes. When we returned from China, the Berkmans (Jason’s sister’s family) were on their family vacation, trekking through the mountains of Montana. But last Saturday, as soon as they landed, they made a bee-line for our front door to meet the newest Baker/Berkman cousin. And let me tell you, it was a moment. I think Mia Grace is still wondering who all those females were swarming around her, squealing with delight. It was the same feeling I had at the airport when she encountered so many loving arms and faces of dear family and friends. And shock of all shocks, the person she preferred most out of everyone was…Lance. My oldest niece had to pry her out of his arms so she could get a hug in! I’m thinking she just new a great-girl dad when she saw one. I have loved watching the way kids love on Mia Grace in a way that is so natural, open, and all-embracing. They never ask about her nose or lip, never are stand-offish because her skin is a different color, and never seem to wonder about the fact that her past is so very different from theirs. They just love her. Fully. Right where she is. There is a something about the heart of a child that loves another child with a need so deeply, and that is something I have never had the privilege of observing until the past few weeks with Mia Grace. From Berkman cousins, to Baker boy cousins, to Ince cousins, to neighbors, to dear friends, children love and embrace this child, and it is so moving to see. Hannah, the oldest cousin, spent the week with her fellow cheerleaders at cheerleading camp, and I know how much she has missed seeing Mia Grace. So last night, I did another thing that probably wouldn’t rank as a top ten moment with most newly adoptive parents – (I’m still feeling a bit of mommy guilt) – but I surprised Hannah, along with the other ten cheerleaders, with a surprise visit from Mia Grace. I laughed so hard I think I snorted coffee up my nose! Only Cara. Or, should I say, only Carl…there are definitely benefits to being raised by brothers.